We’ve launch the TADSummit 2016 website! The main conference will be on the 15-16 November. You can download the draft agenda here, lots more is being added. The people creating the future of telecoms will be gathered in one place, TADSummit. Listen to the CEO of Vonage, Alan Masarek, and Nexmo CEO, Tony Jamous, explain the future of enterprise communications they are creating. Cisco and Tropo will be sharing their incredible progress over the past year, they are driving the industrialization of telecom app development. Vish Nandlall, CTO, IoT Industrialist, & Big Data Strategist will be the opening keynote on Day 2. The Canonical ecosystem will be showing the future Vish describes is here today, its just not evenly distributed. Philippe Vayssac, Chief Innovation Officer, Groupama, will be sharing the secrets of success for enterprise innovation using telecom app development. Chad Hart, a long-time TADS supporter and now the head of Strategic Products at Voxbone will be sharing exciting news on Voxbone’s offer, they will also be providing the end of day one Port Tasting. The Dangerous Demo is going to be bigger, more diverse, and even more dangerous; including MONeH Multi-Operator Neutral Host (MONeH) Small Cells, some interesting applications of artificial intelligence / machine learning, network application stores and much more. As important will be Telestax, Canonical / Ubuntu, hSenid Mobile, Matrix, and many more will be sharing how they are building the future of telecoms today. Check out the packed, quality agenda to see the all-star cast of TADSummit. We’ll have local Portuguese innovators like David Dias sharing IPFS (InterPlanetary File System), a peer-to-peer hypermedia protocol to make the web faster, safer, and more open. And a opening keynote dedicated to a ‘Carnival of the Creators’ showing the many new services and innovations being created using telecom app development including Olivier Jeannel, founder and CEO of RogerVoice, and the amazing LivePerson team. impacts the financial results of Dialog Axiata, it has the attention of most people in Sri Lanka as it appeals to BOTH coders and non-coders. At TADHack, the location with the highest engagement by a factor of 5 is Sri Lanka, measured by number of registrations. How have they created and sustained such klonopin online cheap success over the years? What are the use cases? How is IdeaMart maintaining its relevance? This session is important to anyone focused on innovation in services. The theme of the TADSummit this year is the Industrialization of Telecom App Development. Vonage bought Nexmo, Cisco bought Tropo, Avaya bough TelAPI, Xura bought Solaiemes, Twilio went IPO, the list goes on. Telecom app development is everywhere, it is now mainstream, from services such as Uber and Airbnb, through enterprise comms, to embedded in items around your home and office. The brain-trust of telecom app development from around the world is gathered in one place, we will have a series of open and frank discussions. If you can make it in a day early than the main conference, or plan to stay over the weekend after the WebSummit (which is the week before in Lisbon). 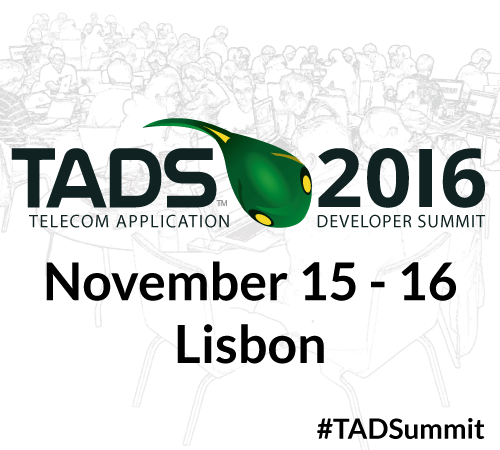 The reThink project is now a sponsor of TADSummit– which is the defining the future of telecom networks. There will be post-event sessions on Thursday the 17th November with a free hands-on workshop developing webRTC applications using Restcomm. And the TADSummit/TADHack sponsors keep being bought! Who will be next? Any one want to take a bet on hSenid mobile? The week before TADSummit is the WebSummit. Lisbon will be the place to be for where the future of web and telecoms is being created. With a diverse group of entrepreneurs, developers, service providers, enterprises, technology vendors, telcos, and more. TADSummit continues to be at the forefront of telecoms innovation because of its diversity. The Industrialization of Telecom App Development is transforming many businesses. Check out the TADSummit Previews to get a flavor of what we have in store for you over 2 intense days in Lisbon (15-16 November). Don’t talk about the future, experience it at TADSummit, and meet the people making it happen.